The ribbon has been cut on the project to surround Capitol Hill Station with housing, retail, and community development. Come 2020, commercial activity will return to the block for the first time since 2006 and a whole bunch of new Capitol Hill neighbors will call this stretch of Broadway home. But, first, current neighbors need to deal with two years of construction and the rise of two new tower cranes in the heart of Broadway. Here’s how to keep up to date. This Capitol Hill Station Project Page from the development’s lead contractor Lease Crutcher Lewis will be used to keep the neighborhood alerted to coming construction, the latest milestones, and when big new elements of the construction process will be moving into place, a project representative tells CHS. Russ Flint, owner of Rain Shadow Meats, says sales have dropped between 13 and 20 percent each year since construction began in earnest in 2013, while his newer Pioneer Square location remains steady. Obviously there could be tons of factors at play here, but Flint points to instances when construction shut down Melrose on a Friday or plans called for blocking all street parking the entire week of Thanksgiving (those closure dates changed after some serious pushback from Melrose Market businesses). If you’re performing repair work on a major city thoroughfare, these are the times that cause the least disruption. If you operate a business that sells food (like, say, heritage Thanksgiving turkeys), it’s the financial equivalent of a sucker punch. Cheese monger Sheri LaVigne announced that construction headaches are enough to force her to close the market’s Calf and Kid cheese counter. Her Culture Club cheese bar opened late in 2015 on 12th Ave. UPDATE: LaVigne tells CHS Calf and Kid will live on. She’s moving the cheese counter to Culture Club where you’ll be able to enjoy cheese flights and pairings — and, now, pick up some of LaVigne’s delicious selections to take home. Restaurateur Matt Dillon, who operates two businesses inside Melrose Market, also told Seattle Met that construction is disrupting his restaurant’s business. Dillon just opened Upper Bar Ferdinand inside Chophouse Row on 11th Ave, Dunn’s newest project. If a new set of rules work as intended, it should be a lot safer to walk — and drive and bike — around Capitol Hill’s continuing wave of big construction projects. The Seattle Department of Transportation has new rules to govern when and if a developer can close a sidewalk during construction. The biggest change, according to Brian de Place, street use director for SDOT, is a policy statement that changes the tone for sidewalk closures. As a general rule, it’s expected that Seattle sidewalks shall remain open during construction. “Closures are a last resort,” de Place said. As a result, future projects are expected to find a way to keep the sidewalk passable rather than sending pedestrians across streets and around blocks. “That’s out default. That’s our starting point,” de Place tells CHS. “You are minimizing the instances when someone has to cross the street.” The new rules mean a new effort around enforcement. 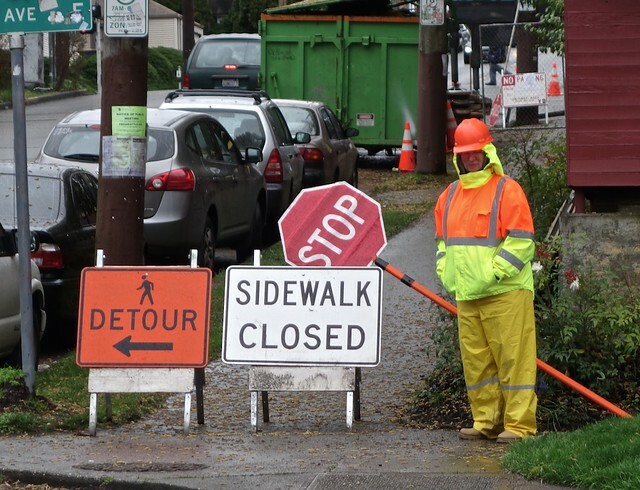 If you see conditions around a construction site which you think are unsafe, report them to SDOTConstructionHub@seattle.gov. Specific locations and pictures can help make sure things get cleared up as quickly as possible. It sounds nearly biblical. With service slated to begin in less than a year and the bulk of tunnel and station construction complete, Sound Transit has announced that its contractors will begin a new phase of work this weekend to recreate the sidewalk, curbs, and gutters around Capitol Hill Station along Broadway and E John. Details of the construction work are below including the planned removal Saturday of the big red “conex box” used for pedestrian safety along E John adjacent the construction site. Removal of the Big Red Wall is also underway along with the art projects that have accumulated on the block over the the past five years. Sound Transit estimates the restoration will take about six weeks. Meanwhile, we’re told Sound Transit was preparing a response to Capitol Hill Housing’s protest over details of the proposal from Gerding Edlen for the Portland-based developer to lease or purchase — and then develop — the transit agency’s two acres of land surrounding Capitol Hill Station. All sides say the issue is moving forward and that they expect to have a resolution in place before a planned May 16th open house. Sound Transit’s contractor has obtained a noise variance from the City of Seattle to remove the pedestrian conex box on E. John Street between Broadway and 10th Avenue E. from 7 a.m. – 6 p.m. Saturday, May 2, 2015. Residents may hear noise from the equipment used to remove the conex box and from trucks used to load and haul the pieces from the site. There will be intermittent closures of the eastbound curb lane on E. John Street in order to safely complete the removal. A police officer and flaggers will direct vehicles and pedestrians around the work area. Following the conex box removal, crews will begin to demolish the red wall at this location, then install curbs, gutters and sidewalks along the east side of Broadway between E. Denny Way and E. John Street and along E. John Street between Broadway and 10th Avenue E.
On-street parking will be restricted along Broadway between E. Denny Way and E. John Street during restoration work. This phase of restoration is expected to take approximately six weeks to complete, depending on weather. Flaggers and detour signage will direct vehicles and pedestrians around the work area. Intermittent daytime noise from demolition and saws and jackhammers as crews break up concrete and repave the area. Sidewalk closures and restricted on-street parking in the work area. Further updates will be provided as work proceeds in the area. Greater Capitol Hill will be home to at least 600 new apartment units in 2015 as the most recent wave of ongoing construction projects finally finish up. A recent report from Dupre+Scott Apartment Advisors projects 729 new units will open in 2016 and 707 in 2017. In all likelihood, the true number will be even higher as the Dupre+Scott report doesn’t count microhousing, subsidized/nonprofit housing, or buildings that have under 20 units. Last year, the real estate analysts counted 778 new units in the Capitol Hill region, which includes Eastlake and First Hill. Across the Puget Sound, a record total of 12,000 apartments are expected to open this year, Scott said. Some 48,000 apartments are expected to open in the region by 2019. Capitol Hill’s Sweatbox, one of the first purveyors of Bikram Yoga in Seattle, is in a fight for its life to survive years of 10th Ave construction. Thousands of new residents — and potential yoga students — are coming to Pike/Pine. The studio’s Laura Culberg is doing everything she can to hold the pose until they get here. “We’re just trying to get a breath,” Culberg told CHS. Culberg said that ongoing construction and torn up streets for infrastructure upgrades to support new Pike/Pine developments have severely damaged Sweatbox’s Capitol Hill business. It’s a similar situation at the other businesses on 10th and 11th just south of E Pike though the likes of Neumos have so far weathered the challenges. There is no public mitigation money for the private projects necessitating the work. Instead, Culberg said she was forced to file a claim with the city asking for more than $11,000 for lost business — one life raft she has been hoping for to help Sweatbox survive the ongoing lean times. This is how the corner of 15th and Madison looked three Earth Days ago. That roof looks pretty green. that used to be a gay bar. Over the weekend, one of the finishing touches before next Monday’s celebration of the project was completed as students planted the landscaping inside the overhauled McGilvra Place Park that fronts the Bullitt building. A Seattle U study once called the urban greenspace “the loneliest” place on Capitol Hill but CHS liked it fine for sitting for a summer lunch as Madison rushed by. The new Pacific Northwest-lush plantings will make it even nicer.